Wounded Times: TWIN HOMELESS VETERANS NEED YOUR HELP NOW BECAUSE THEY ARE 84! 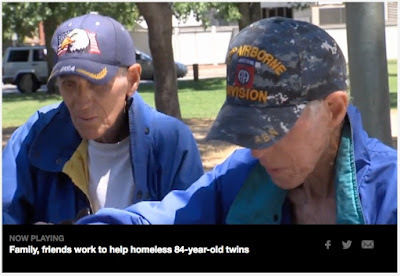 TWIN HOMELESS VETERANS NEED YOUR HELP NOW BECAUSE THEY ARE 84! Twin homeless veterans Gary and Clifford Koekoek received an outpouring of support after our story detailing their struggle with homelessness aired last week.The twins, 84, have been homeless for the past two years, forced to sleep primarily in their car after their longtime residence was foreclosed on. The property listed under their names was repossessed in 2015, according to information available through Trulia.Since the story aired, donations poured in to a GoFundMe page intended to secure housing for the brothers, and Veterans Affairs was rumoured to be assisting the twins.Tara Ricks, the Chief Public Information Officer for Veterans Affairs of Northern California, confirmed that the VA is working with the brothers, but could not provide specifics due to privacy concerns.The GoFundMe page set-up for the brothers by a friend has far surpassed its original goal of $25,000, hitting approximately $125,000 in 8 days. Clifford and Gary Koekoek, 84-year-old twins who've survived living under Nazi occupation and fighting in the jungles of Vietnam, are now in "hell" and sleeping in their car after a bank foreclosed on their California home in October. Born in the Netherlands, Clifford and Gary grew up under Nazi rule before coming to the U.S., where the brothers worked in Hollywood and then served their new country at war. But the brothers told FOX 40 Sacramento nothing they've lived through compares to their current predicament.